Rick Riordan has become one of my favorite authors! The Maze of Bones is a very fast-paced and interesting book. Dan and Amy Cahill are at the funeral of their dear grandmother, Grace Cahill. Grace had been their guardian ever since their parents died and they loved her very much. Grace left each of her relatives an envelope. It was an invitation to join a Clue hunt. 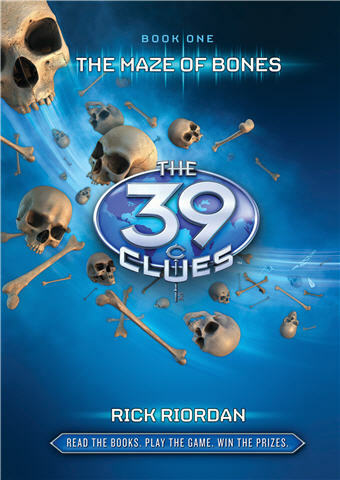 There were 39 clues and all together, they would lead to a power of unimaginable greatness. Dan and Amy could either join the Clue hunt or take a million dollars each and go on with their lives. They decided to join the Clue hunt and watched the check for a million dollars go up in flames. Dan and Amy’s other relatives also make their choices and the people who have chosen to join the Clue hunt receive an envelope. The envelope contains a single hint as to what the first clue is. The hint reads: “Resolution: The fine print to guess. Seek out Richard S____.” Dan and Amy are warned by Grace’s lawyer to: “Beware the Madrigals.” Who the Madrigals are, they don’t know. While Dan and Amy are on the Clue hunt, they discover that all is not what it seems, and that there are people out there willing to kill them. Will Dan and Amy figure out the first Clue?